At the start of the year, Sydney forced us to transition the girls from cribs to toddler beds. Being a daredevil, Sydney escaped from her crib, which meant keeping the girls in cribs was no longer safe. 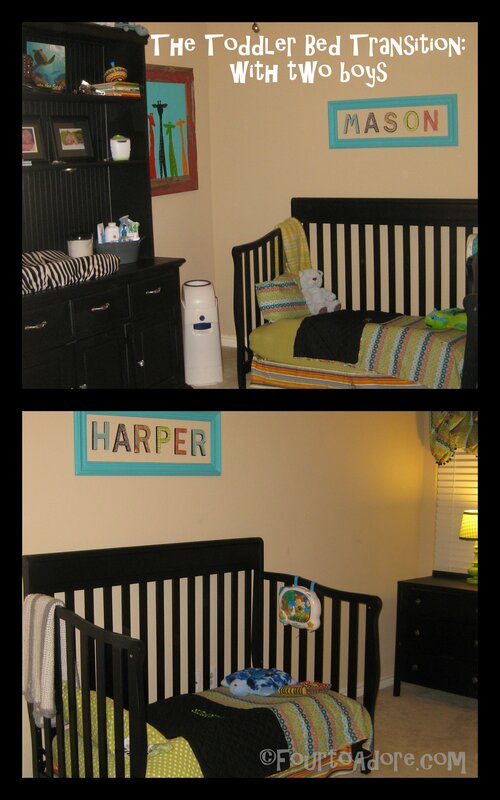 Since the boys are rather mischievous and had not attempted such an escape we kept their cribs intact. I was absolutely content with this arrangement. Since moving the girls to toddler beds, they’ve done well, but naps are sporadic at best. They tend to gab to each other as if it’s a constant slumber party. 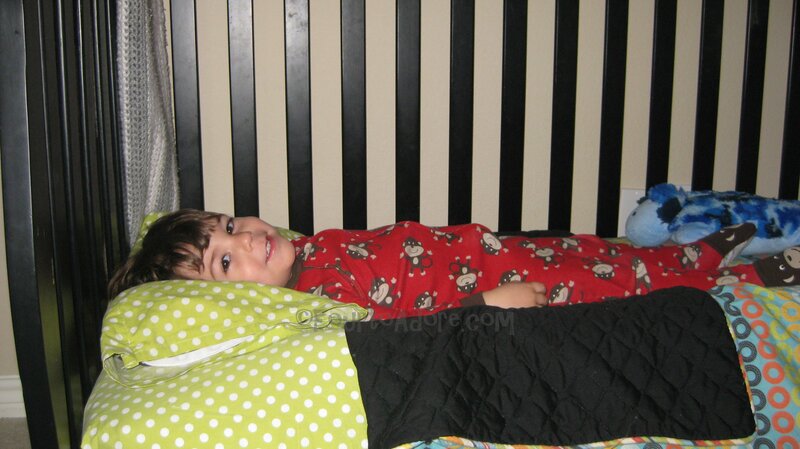 Recently, Mason began trying to go to bed in the girls rooms and occasionally asked for a big boy bed. He really tugged at George’s heartstrings on this one. After some thought, George and I decided spring break week would be best for this change. 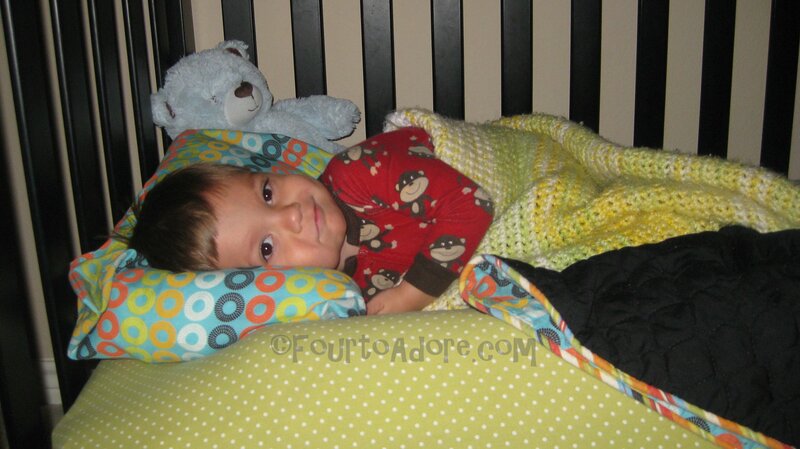 It meant I’d be home all week as we eased into toddler beds. 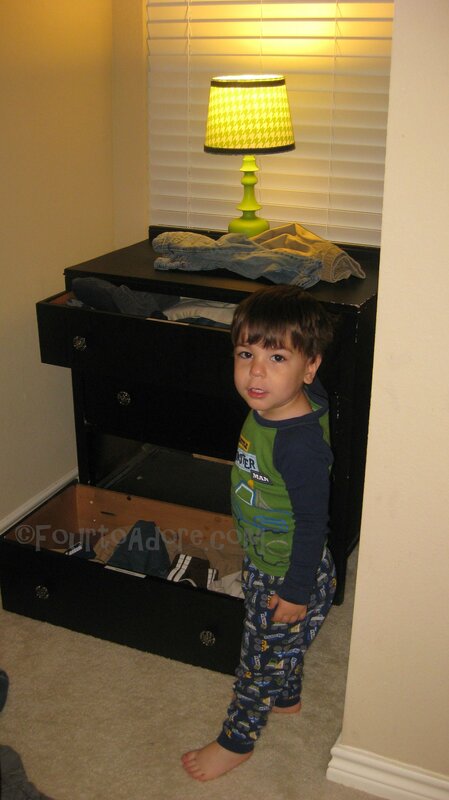 The day prior to the big change, George inspected the boy’s room for final toddler proofing measures. All furniture was secured to the wall, latches were installed to the closet door and cabinets, electrical cords were secured, outlets covered, blind cords clipped, and the chair removed. 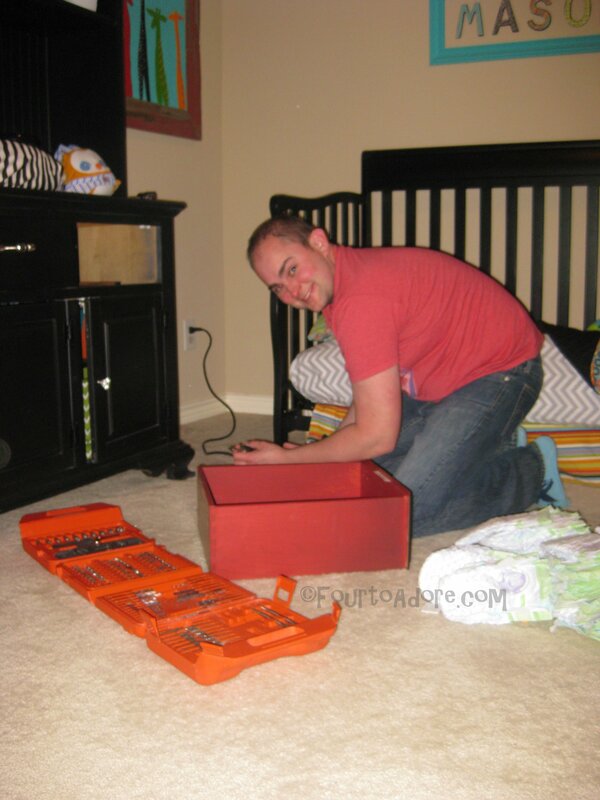 George then removed the front panel on both cribs. We introduced the OK To Wake! Owl, and explained that the boys were to stay in bed until the owl illuminated green in the morning. 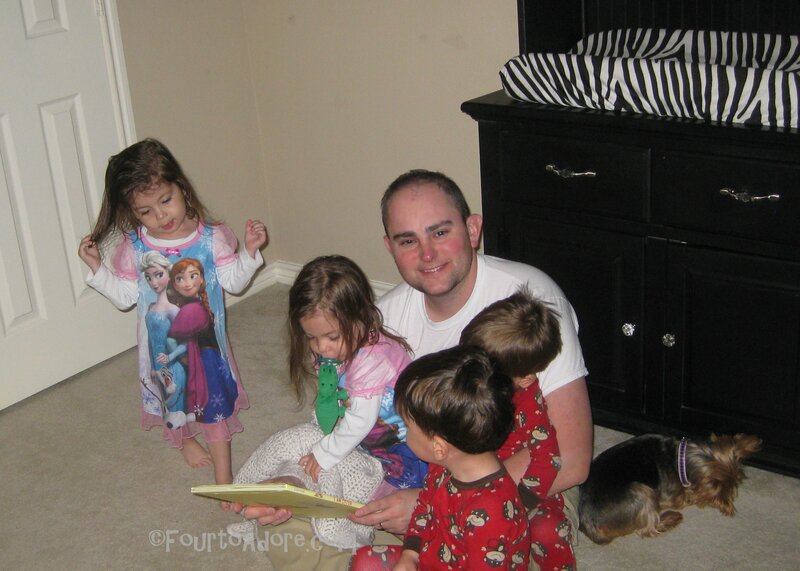 George read bedtime stories to the crew before tucking the boys into their new beds. Following story time, both boys scrambled into their respective beds as if they’d done it a million times. It was so easy. Too easy. Once prayers were said, I flipped off the lights and both boys snuggled under the covers. About 30 seconds after we left the boy’s room, they both came charging into the playroom. I’d forgotten to secure the door knob cover. Once I wrapped it in a few layers of packing tape, they were set for the night. George and I retreated to the den for some television watching and braced ourselves for protest. I checked the baby monitor multiple times, and instead of finding distraught boys, I found two sweetly sleeping boys. Much to my surprise, we didn’t hear a peep out of them until 7:30 am when Mason proclaimed, “It’s okay to wake! The owl is green!! 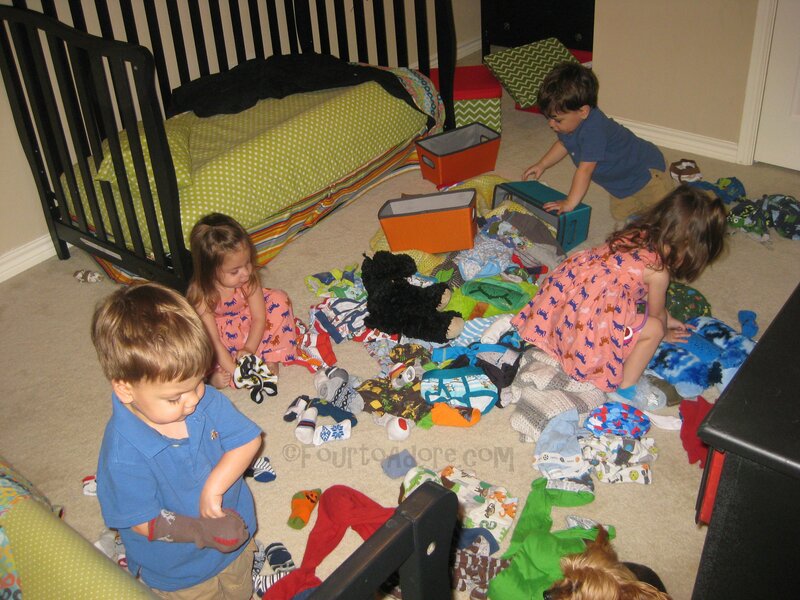 !” I was even more surprised when I found their room totally undisturbed. 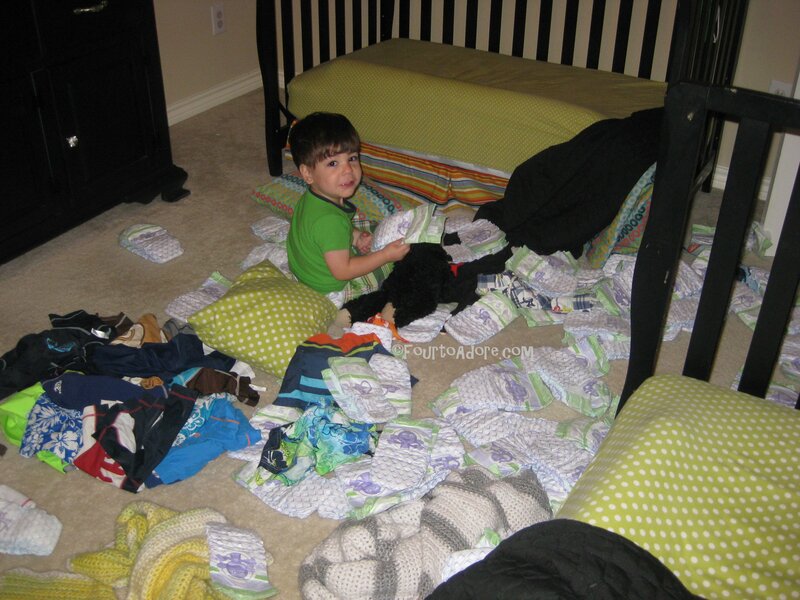 Though the room was toddler proofed and immediate hazards were removed, I anticipated a few trouble spots. Fully expecting these things, I begged George to install latches on EVERY drawer. His reply, “Let’s see what happens. Give them the benefit of the doubt.” While I want them to learn independence, sometimes my sanity is worth taking extra precautions. I had a little side of crow for breakfast the first morning after toddler beds. The first day they went down for nap without too much trouble, except they never actually fell asleep. Instead they had great fun swapping beds and playing all sorts of imaginative games. At the end of nap quiet playtime, everything in their rooms was in order. When I went to get the boys up the second morning, I was greeted with a light citrus fragrance trailing from their room. Undeniably familiar…GermX hand sanitizer. 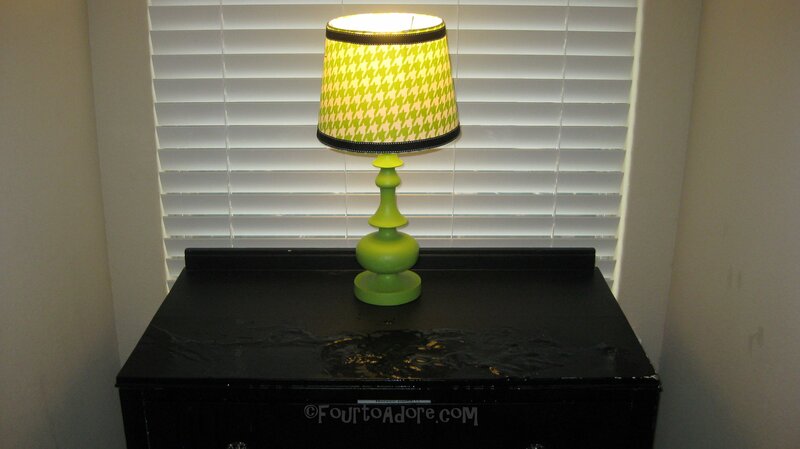 Inside, I found Harper squirting the last few drops of a once full bottle of GermX all over the dresser. It was one germ-free dresser that’s for sure. Aside from the sanitizer, things looked good. 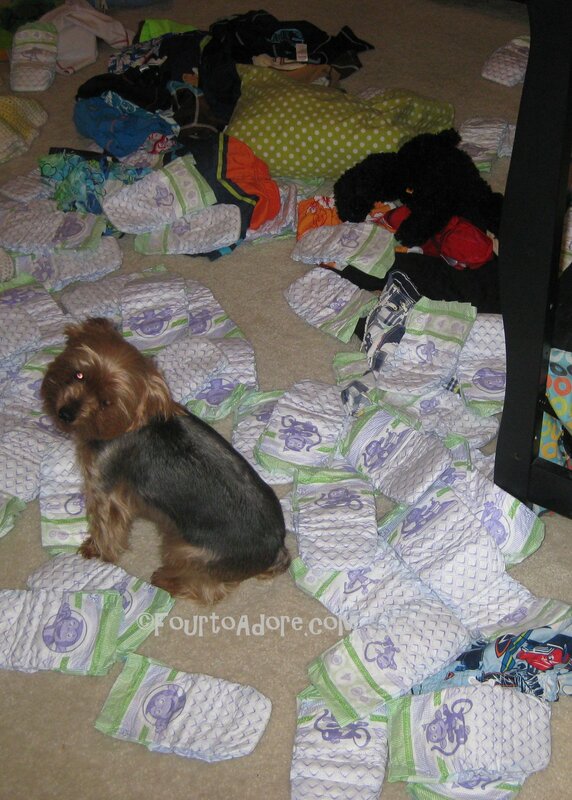 On the third morning, I discovered socks in the diaper champ and diapers/ swim suits strewn about the room. I was fed up with these shenanigans especially considering at least one was preventable with a strong latch. I shot off an angry text complete with pictures for George to see. His reply, “Mismanagement?? ?” Oh no, mister! I was NOT pleased with this response. I wanted some serious latches. The boys were different size diapers, which meant I had to sort through each one. On day four, the morning went smoothly even though George hadn’t yet installed any new latches. I crossed my fingers for nap, but it did not go well. About an hour into nap, I heard something suspicious. Harper managed to dismantle the diaper champ and shredded the garbage bag inside. Thankfully I emptied it just prior to nap so there were no diapers inside. I suspected they may put things in the Diaper Champ, but never thought they could take it apart. 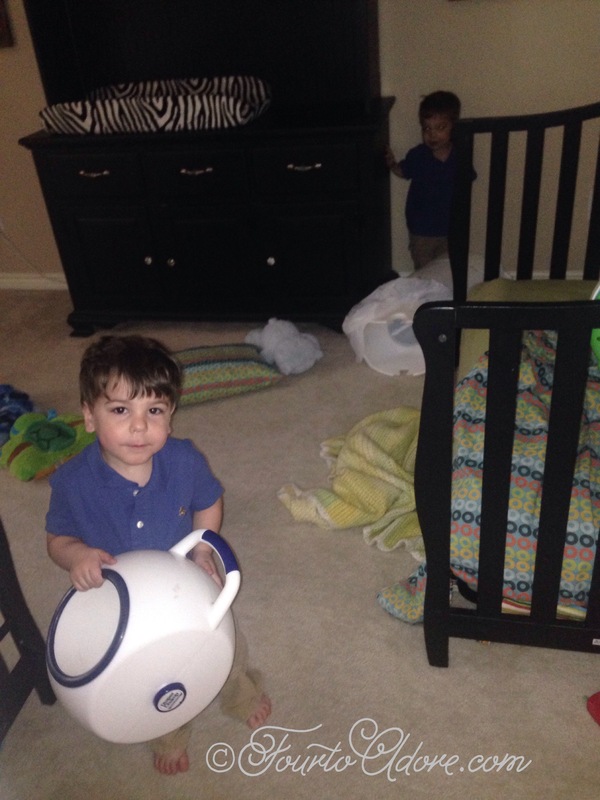 I ended up locking the Diaper Champ in the closet, scolded the boys, and put them back to bed. The rest of nap did not go any better, the boys finagled a cabinet door open where George had installed a latch. Once inside the cabinet, they had a hay day scattering undies, socks, and pajamas everywhere. Harper informed me he was making a train. To his credit, he lined the baskets up and it did resemble a train. The only good thing about this mess is that it forced me to do a little spring cleaning. Despite the now daily shenanigans, George didn’t see a need for additional latches just yet. On the fifth morning of toddler beds, I woke up to find all of the dresser drawers pulled out with pants scattered about the room. The drawers aren’t terribly big, but for toddlers are slightly heavy so George finally agreed to latch them. AMEN!!!! Today was the first morning when things were not in shambles. Instead of trouble, I found Mason holding the owl so it would cast light on the door as Harper created shadow puppets. That charade warmed my heart. The morning was smooth, nap not so much. 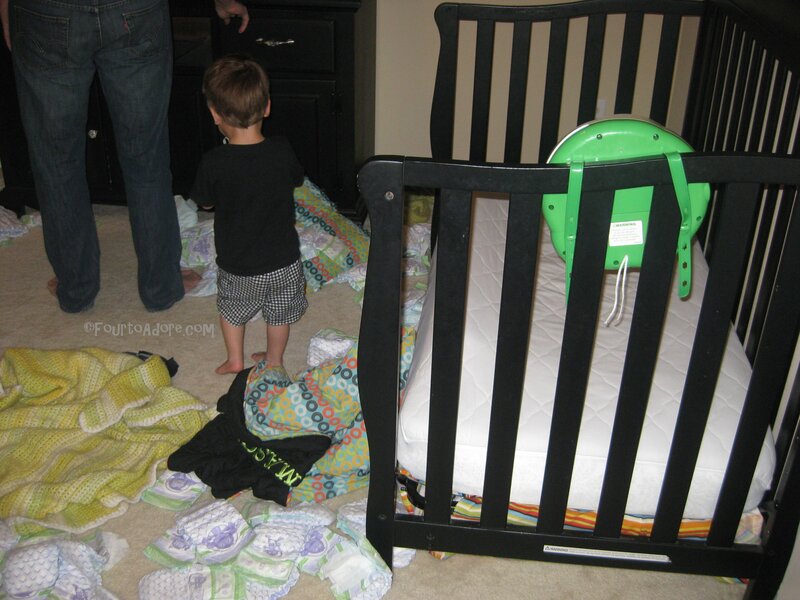 This time time they removed the sheets from their beds and got into the diapers again. Desperate for the boys to take a nap, I settled them onto pallets and rubbed their backs to settle them. It worked like a charm! After a full week of toddler bed mayhem, I harassed George enough for him to install latches on the remaining accessible drawers. Of course, these guys are a clever pair so I’m sure they’ll discover more mischief. At least I can rest knowing we really exhausted all toddler proofing options available, and George can rest knowing I won’t pester him anymore. 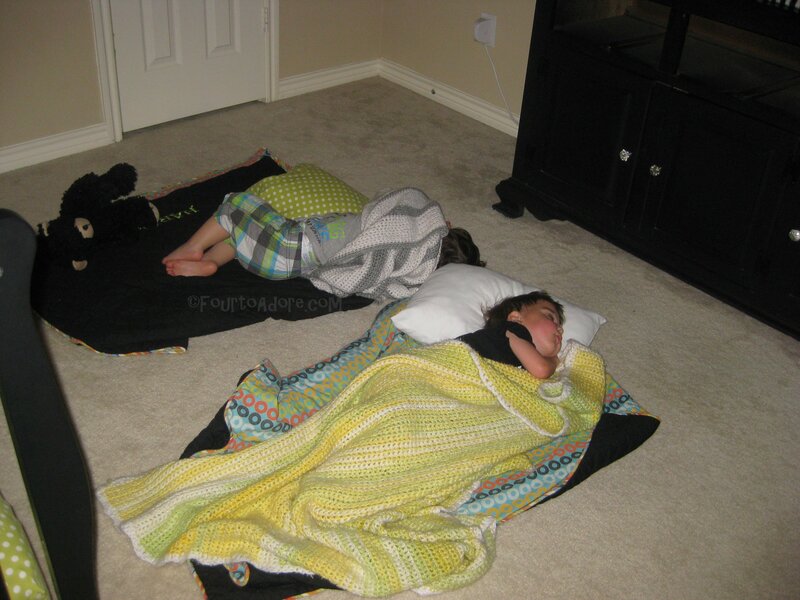 Even though the boys have created far more messes than the girls could ever imagine, I have to give them kudos for going to bed easily and staying asleep through the night. The girls keep their room tidier, but getting them to bed is a bit more problematic. We haven’t had reliable naps since the kids switched to beds 😦 I watch on the video monitor and tell them to go back to bed every time they step off, but even with that restriction they are finding ways to keep themselves awake (they toss a blanket in between the beds and play tug of war, technically not leaving the beds, for example). It’s gotten to the point where the naps are so unreliable that I’m wondering if it’s worth keeping them. They do still need the sleep but often jump around for 2 hours instead of sleeping, and I am not getting a break because I am watching them on the monitor, and it ends up making me frustrated and tired! I feel your pain!!!! Naps have been spotty since the girls made the switch. I don’t watch them on the monitor the whole time, and I am okay if they get out of bed. With the girls I could generally rest. The boys are soooo different though. They get into mischief so I have to go in much more than I ever did with the girls. Mine need the sleep too, and are intolerable in the evening if they didn’t nap at all. I’m wondering if I should come up with some safe, quiet play activities to leave in their rooms so we can all rest even if they don’t sleep. I wish I didn’t have to watch them! The times I don’t watch them, they NEVER fall asleep, they just keep each other riled up until nap time is over and then are disasters later! The only way I have gotten them to sleep is to watch them until they do eventually settle down, but sometimes that never happens. Ugh! I’m fine if they just sit on their beds and read, or play with some stuffed animals, or sing or whatever, but it’s the jumping and throwing stuff and (if I’m not watching) the opening drawers, climbing on things, hitting/biting/etc … What a mess! My non-multiples friends all have the same helpful suggestion of separating them for naps, but they have never slept alone in their entire lives! I’m dealing with that problem with the boys right now…they jump, bounce all over, squeal, ect. The girls did some of that the first week or two but not nearly to the degree of the boys. They’ve made huge messes too. I only got them to sleep by rubbing their backs. I really hope the newness will wear off and we may nap again.